The pattern I use is, in fact, exceptionally basic. I clocked it this morning and it took me precisely 1.5 hours start to finish with brief (but incessant) interruptions for coffee, shoving husband out the door to work, making cereal for two Denizens, another cup of coffee, loading the dishwasher and cleaning up a spilled bowl of cereal. While Captain Adventure giggled madly, pointed, and yelled, “UH-OH! OH NO! UH-OH! OH NO! !” and tried to splash in the milk puddle. Adorable children. Really they are. You can use DPNs or, if you’re like me and extremely lazy prone to losing DPNs and only finding them by sitting on them into current technology, two circulars. A good primer on knitting with two circulars is here. I use baby weight yarn (like Simply Soft or Red Heart Baby – as I mentioned before, if you’re knitting these for charity they like the acrylic rather than wool due to potential allergy issues) and #4 (3.5mm) needles. The gauge works out to 6 stitches and 8 rows to an inch. Not to bring down the wrath of the gauge gods upon myself, but – whatever size it ends up being will be useful. 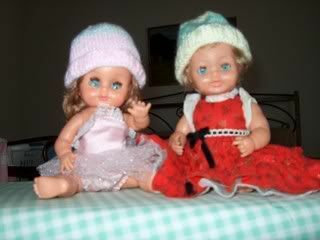 You can make a whole hat and call it a gauge swatch, it will fit one of these little people. It takes under an ounce of yarn altogether for the preemie – I weighed one last night and it came out to 1/2 an ounce finished weight. Work 8 rounds of rib – I default to K2/P2, planning to flip the rib up as a kind of brim. (If you hate rib with the passion of a thousand burning suns you can always skip it and go straight to stockinette – it creates a ‘roll brim’ hat which is equally cute) (or do seed stitch, or reverse stockinette, or whatever else makes you happy). After the rib, switch to stockinette and carry on until you get to a total hat length of 4.5” for preemie, 5” for large preemie, or 5.5” for newborn. This is the part where you can easily play with color, add in stripes or whatever else suits your fancy. Or, just keep on keepin’ on until you’ve got the length you want. At this point, you should be down to six or less stitches. Cut your yarn, draw it through the live stitches, and pull it tight. If this is for hospitals they’d prefer no pom-poms or other things that might conceivably choke the baby (gee, go figure) – generally, I make the draw good and tight so there is no more than a wee tiny hole, and then I draw the yarn end down through it to plug it up even further. An AWESOME! site for preemie patterns (and lots of other good stuff, actually) is at Bev’s Country Cottage . If you’re looking for someone to send them, check out the Knitting 4 Children group on Yahoo – they have a long list of charities, just about anything you produce can find a home. They even have a place for your scarves and ‘big kid’ hats! When I’m not doing a shower for Knitting 4 Children, I usually send my things to Stitches from the Heart. They’re a great outfit, and send to hospitals all around the country. They gladly accept things for preemies up to toddlers, and a good home will be found for all of them. Today’s was the standard 48 stitches, 8 rounds K2/P2 rib (flipped up to form brim), followed by 8 rounds each of white, pink, white, and then the crown in pink again. Tres cute for the little ballerina, non? Thanks for the info! Now I've got something worthwhile to use all that acrylic yarn that's been sitting around from my beginning beginner days. Thanks, Tama! I've enlisted my mom's help to get me going and I'm going to get started right away. If one of these takes you 1.5 hours, I should be just on track to finish one by the end of the month in time for that 'shower'. Heh. Oh, and I recently saw a picture from Christmas of my Munchkin playing with her new doll and said to myself, "self, I've never seen that doll before ..." then realized I didn't recognize her with her clothes on!